If you're reading this review, you should have no trouble appreciating Richard B. Riddick, as he's a badass character kinda like our own Duke Nukem. But while Duke is kinda flamboyant, Riddick keeps to himself and as such, he relies more on stealth, preferring to snap necks from behind over shitting down aliens' necks. 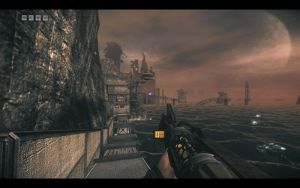 This Chronicles of Riddick title includes two campaigns: Escape from Butcher Bay and Assault on Dark Athena. 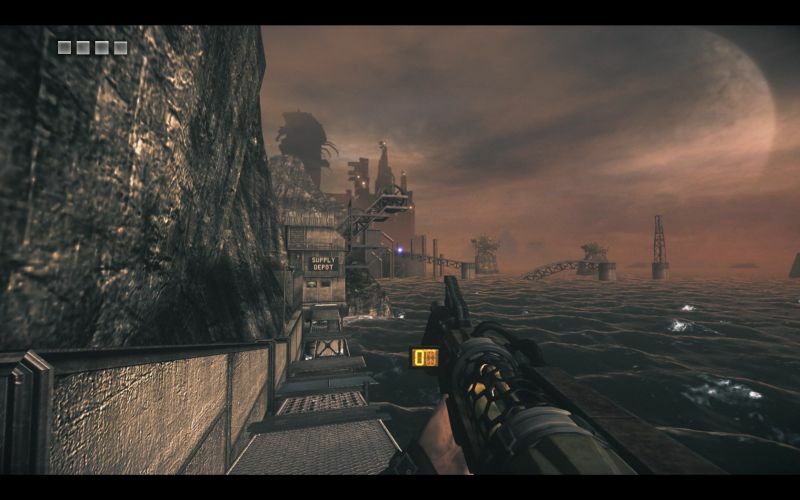 Butcher Bay was first released in 2004 but it's been given a facelift. 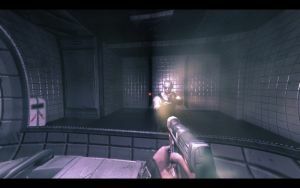 Dark Athena is a new (2009) campaign and a direct sequel to Butcher Bay. 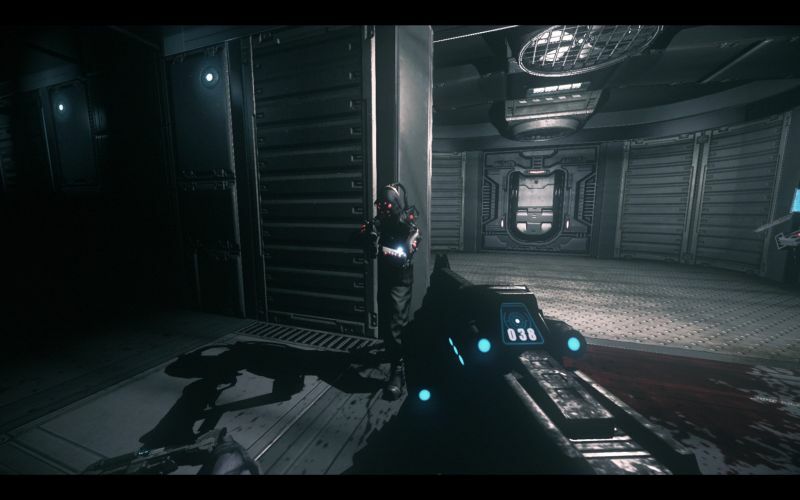 Both games have the same interface so moving from Butcher Bay to Dark Athena is a walk in the park. Butcher Bay took me 8 hours in total while Dark Athena was an hour shorter. There's also a multiplayer mode but no one seems to play it. Escape from Butcher Bay is not quite your standard first person shooter. It takes a while to get used to how everything works, because you'll mostly have to do without guns. There's a good tutorial in the beginning, but if you've recently been playing straightforward shooters it's gonna take a couple of hours to get a hang of the game. I almost gave up after an hour, because of the lack of manual saving and a stupid "puzzle" that involved having to shoot a mech in the back, despite the fact that there was no apparent "weak spot" there, but I'm so glad I didn't because Butcher Bay is one fun ride. 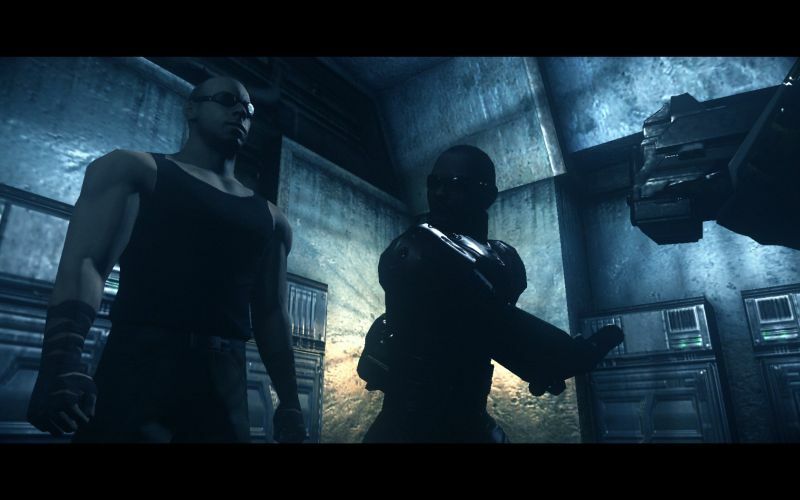 A big part of the game's appeal is due to the fact that it's essentially a canonical part of The Chronicles of Riddick franchise. Riddick's escape from Butcher Bay was mentioned in Pitch Black: this is your chance to act out that escape (mind you, it's a bit clumsy "escape" as Riddick is captured no less than four times during the course of the game). Vin Diesel was heavily involved in designing the game and his voice acting is perfect. And that's another part of the game's appeal: Riddick. It just makes the game a lot more fun to play when everyone looks up to you as the toughest SOB in the known universe. But once again, I don't need to explain this appeal to you. 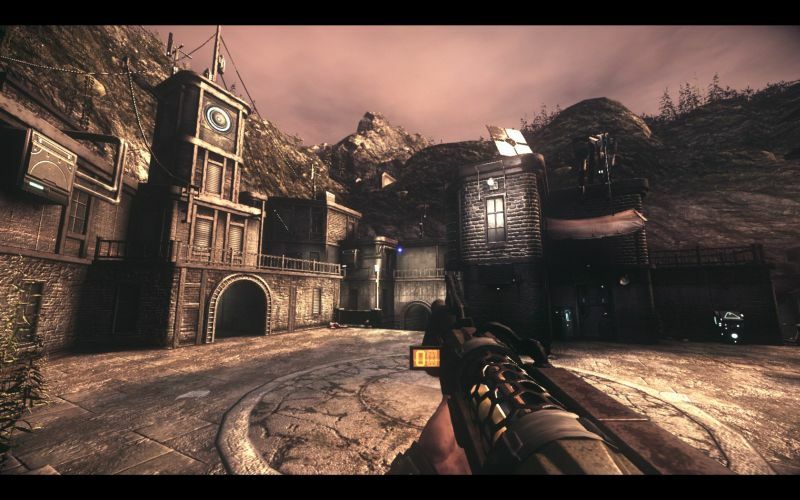 Many, including myself, have described Call of Duty games as cinematic experiences. However, they're nothing like this. Butcher Bay actually provides you some control over your environment and the game is anything but a linear pipe. There are usually several ways to solve an area (fight, go stealth, run) and you're free to move between many of the levels as you wish. Butcher Bay (a maximum-security prison) is the only environment you'll experience but this is fine - I mean, who complained about Black Mesa in Half-Life? The prison feels like an actual location with lots of NPCs, some of whom offer you sidequests. 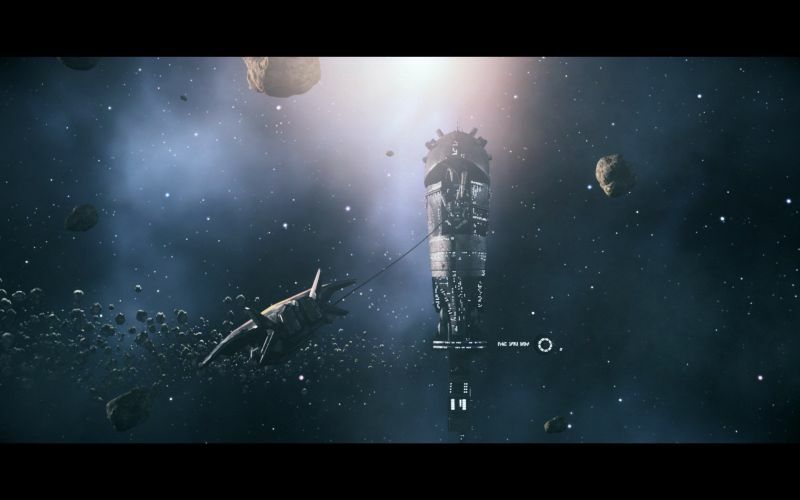 Long-range weapon combat is the game's biggest shortfall. There's a horrible, ancient zoom mode (well, the game is from 2004 but the mode is recycled in Dark Athena) which pretty much ensures that the best way to deal with enemies is to get as close to them as possible, to forget about trying to snipe them from a distance. Considering this shortfall, it's only a good thing that most encounters involve a degree of stealth. 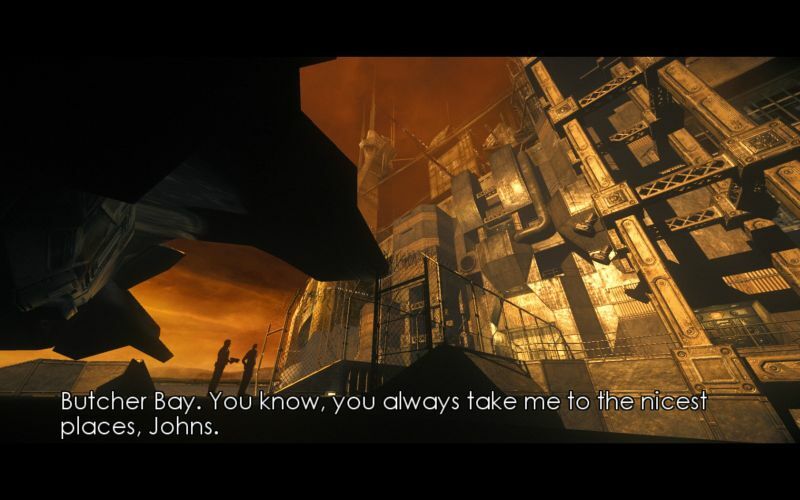 Conclusion: Butcher Bay is a unique opportunity to experience a canonical part of the Riddick franchise. Breaking free from one of the most infamous prisons in the galaxy is an interesting starting point for the game and keeps you motivated throughout, no matter the task at hand. The environment and the characters inhabiting it provide a truly cinematic experience, but the kind of an experience that puts you in control of your destiny. Also, kudos to Vin Diesel for taking his involvement seriously. 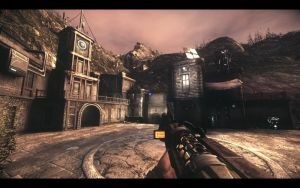 Assault on Dark Athena is a lot like its predecessor but more straightforward in terms of action. There are a few memorable stealth scenes and environmental puzzles but the majority of combat now involves guns instead of fists and stealth. This is slightly disappointing because shootouts are not among the game's strong points (and neither are fist fights). 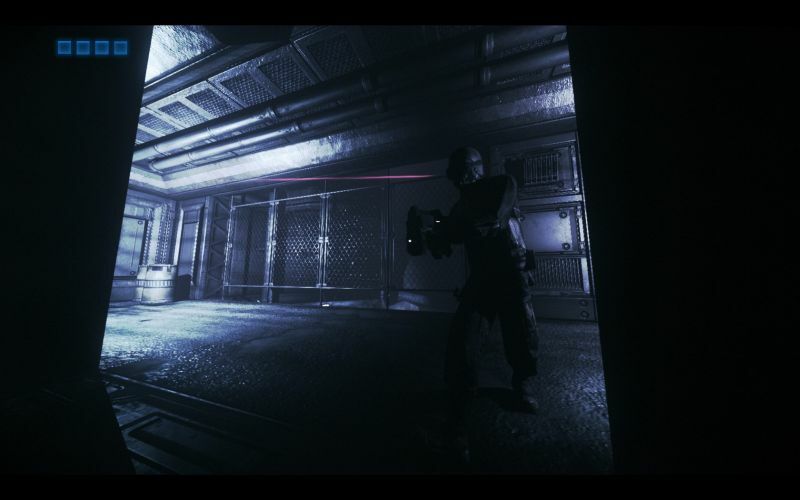 Iron sights should be compulsory in every shooter these days and enemy AI doesn't really shine; often an enemy "hides" behind a corner, leaving bits of himself visible and hardly seems to react when shot at. Another thing that bothered me was that if you happen to make a noise while sitting in the dark, enemies can immediately pinpoint your exact location and start shooting. A couple of times you end up remote piloting enemy machines in scenes that provide a much-needed break just as things are starting to get tiresome. The game's first half's level design is a bit generic. The Athena (a huge merc ship) is a rather typical hi-tech location with basically no original ideas. 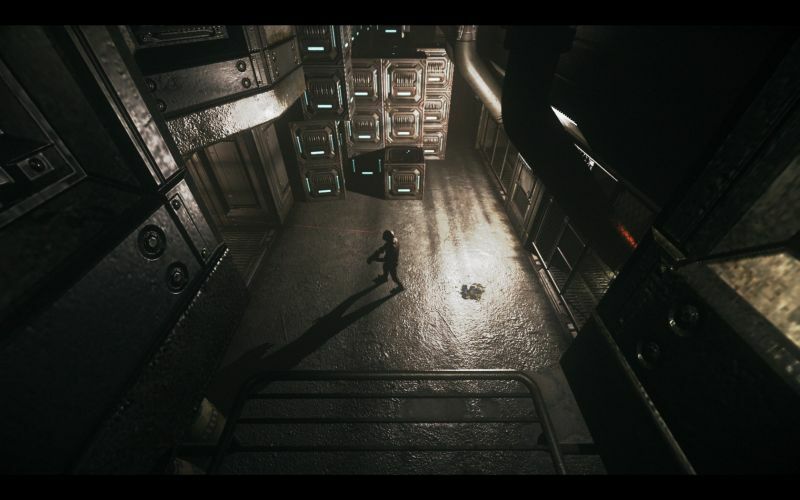 Your trip through the ship is about half of the game's length. This is followed by a visit to a colony on some time-forgotten planet. I enjoyed this half of the game a lot although it's a bit of a lost opportunity. For example, the colony's town sections encourage shooting your way out of all situations while I'd have loved to be forced to rely on acrobatics and stealth to get past enemies. (Think of spotting an ambush in an alley, then having to figure out a way to get to the roofs to get past them.) Also, the first half's gameplay basically consists of completing minial tasks that in Butcher Bay would have been merely sidequests. 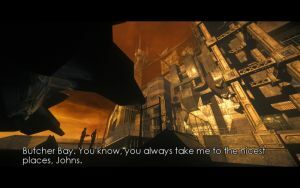 As a result of this, many of the game's dialog scenes are tedious and Riddick's lines are not quite what they were in Butcher Bay. Conclusion: While Butcher Bay felt canonical in that you were essentially playing through a part of the movie franchise, Dark Athena feels somewhat insignificant in canonical terms. But do note that this point only makes Dark Athena pale relative to Butcher Bay; in its own right the game is still above most games I've played in terms of cinematic storytelling. Emphasizing firefights over stealth goes against what Riddick is - it just feels wrong. And yet, there are plenty of memorable moments from cool environmental puzzles to wreaking havoc via remote-controlled machines. 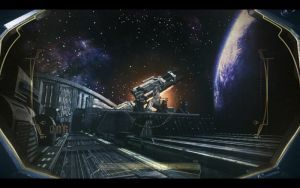 And while the first half is visually generic, the planetside environments of the second half are impressive.